10-30-17 10:00 AM – Good Monday morning from the Snowman. Yahoo the warming trend has ended and things are cooling of a bit this week. The big news is the major change in the weather pattern starting late this week. We are headed for some significant snowfall on Mammoth Mountain this weekend into early next week. Along with an extended period of cooler then normal temperatures, for an epic snowmaking run. Confidence is now high in a change to cold and wet, and moderate that we get 1-3 feet of snow out of this first weekend system. There is also a chance that we do get a more solid sub tropical hook up right over Mammoth Mountain for additional feet of snow on the ground. Bottom line is we really need to wait 48-72 hours more to know with high confidence how much possible footage we will get. Models are still wavering a bit keep holding up to our first call amounts. Snow levels will start out around 8000 feet late Saturday/Sunday and drop to around 5,500 feet by Sunday. Yes new models are delaying the start of the system now making it a Sunday/Monday event. Local roads will turn to R1 next weekend with chain controls possible down to the Sherwin Grade. Time to get your winter car kits set up and be ready to chain up and SLOW DOWN. For the next few days expect a cooling trend with high clouds at times and light winds. Highs will be in the 50s on the hill and down into the 60s in town. Lows will be in the mid 30s at night. 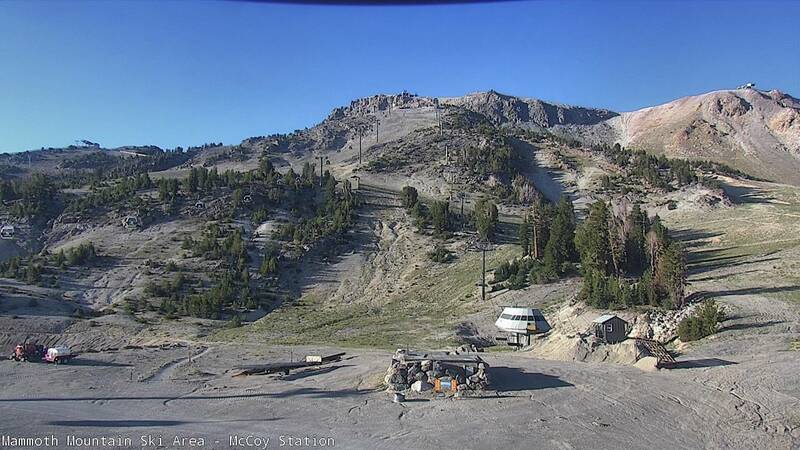 Stay tuned in here at MammothSnowman.com as we will be updating in the AM and PM daily now. Have a great day and if you’re a local get your yard and car ready for winter NOW. This image is the most current GFS and show how man inches of water are on the way. 1 inch of water on average = 10 inches of snow. Here is the Snowfall for the next couple weeks. This image shows cold air in place for the Month of November. Good for Snowmaking! Fall colors are now past peak all over the Eastern Sierra. However there is still a ton of yellows out there to be seen during this warm October week. Old Mammoth, Mc Gee Creek, Crowley and June all have some left over colors to check out. Fall Mountain Biking is in great shape, with last weeks 1-3 inches we have moist trails with a bit of snow out in the Bike Park. Remeber the Bike Park is closed so no lift access. All Inyo Forest Trails are open and in prime shape for a ride. Hiking is still wide open, however there is mixed snow and dirt starting at the 9000 foot level in the Lake Basin and in the Back Country. Also to note Fishing has been going off this Fall here in Mammoth. Perfect time to come up and throw in a line before the snow and cold hits in 5 days. For Local’s it’s time to wake up get your wood stacked and covered. Be ready a world in white is not far off. Feels like Summer today in 6 days it will feel like Christmas. Get ready NOW! *Also to note if you love this web site please consider supporting our content creation by becoming a subscriber. We are having a tough time getting enough advertisers so we need your help to keep this site going long term. Here is the link to learn more.